AKA: Martin Plan C;Super Titan. Status: Development ended 1961. Payload: 7,300 kg (16,000 lb). Gross mass: 185,820 kg (409,660 lb). Height: 53.00 m (173.00 ft). Diameter: 4.06 m (13.32 ft). Span: 15.50 m (50.80 ft). Apogee: 480 km (290 mi). The Dyna-Soar specification was formalized by the USAF on 23 August 1957 as System 464L. This 'Hypersonic Glide Rocket Weapon System' was to be a manned, winged vehicle that would be rocket-boosted to hypersonic speed. The Air Force considered 12 contractors as capable of bidding on the program. Nine vendor teams submitted bids by March 1958. The evaluation whittled this down to two teams: Martin-Bell and Boeing. Boeing proposed to manage the entire project alone, while on the other team Bell would provide the manned glider, and Martin the launch vehicles. In a shock move, Boeing was selected for the glider in June 1959, while Martin was selected for the launch vehicles. The service greatly preferred Martin's booster proposal (Titan I for the suborbital tests, Titan C for global flights). Boeing's vague proposal was to use Atlas-Centaur for suborbital flights, and a booster 'to be determined' for orbital flights. The contract awards for Dyna-Soar were announced on November 9, 1959. By then the program was had gone down to two phases, and then back to three phases - a suborbital test Phase 1, an orbital test Phase 2, and an operational weapon system in Phase 3. The selection of the Titan C for the Phase 2 booster was controversial. This was a Titan II booster stage topped by a new liquid oxygen/hydrogen upper stage. There were several competitors. Unknown to the competitors was that Aerojet was conducting a secret program to develop the engine for the Titan C second stage. The resulting Lox/LH2 version of the Titan LR87 motor was the first large Lox/LH2 engine fired in the world. The entire development took place from 1958-1960, and was of the same magnitude as the parallel, more public modification of the LR-87 engine to burn storable propellants for the Titan 2. The Lox/LH2 engine was essentially an LR-87 regeneratively cooled thrust chamber and nozzle, with a modified injector, and redesigned fuel pump. There were a total of 52 static tests run on full scale flight-weight hardware. Sea level thrust was as high as 59,000 kgf, equivalent to 68,000 kgf in vacuum. Simple impinging stream injectors were used rather than the more expensive conventional coaxial types used later on the M-l and SSME. All start-ups and shutdowns were smooth, and the combustion efficiency reached 99%. Operation was stable throughout and there were no major leakage problems. Early tests used pressurized propellants, but the later ones used flight-type turbopump assemblies. In comparison with the Lox/Kerosene LR87, major changes were made on the injectors, and the RP-1 fuel pump was replaced by a single stage hydrogen pump specially designed for the purpose. The oxygen pump and its gearbox were unchanged from the original design. Despite this demonstrated hardware, in May 1960 Rocketdyne won NASA's competition for a 91,000 kgf upper stage Lox/LH2 engine with their paper J-2 design. Thereafter Martin and Aerojet had to propose the Titan C with a J-2 engine in the upper stage. While glider development continued at Boeing, the booster kept changing. The US Army's ABMA, led by Wernher Von Braun, had the Saturn I launch vehicle under development. There were elements in the Air Force pushing their Space Launching System family of modular launch vehicles. And there was an Air Force requirement, beyond Dyna-Soar, for development of a large booster for its SLV-4 requirement. This new vehicle would be needed by the late 1960's for launch of ten-metric ton reconnaissance satellites into low orbit and heavy communications, ELINT, and early warning satellites into high orbits. We had gone through the whole process of selecting upper stages for Saturn and had made our recommendations to ARPA. We had indicated very clearly that we were willing to accept either the Atlas or Titan as the basis for building the second stage. The real difference was that in one case we would be using the Atlas engines and associated equipment, built by North American, while in the other case, we would be using the Titan power plant built by Aerojet. Largely because of the multitude of different projects that had been saddled on the Atlas, we favor the Titan. Convair built the Atlas, and we had great confidence in Convair's engineering, but this was overshadowed in our mind by the practical difficulties of getting enough Atlas hardware. However, we assured ARPA that we would take either one. The time scale was important. In order to get an operational vehicle in the air as soon as possible, and be able to match and possibly exceed Russia's capabilities, we recommended that the first flying vehicle to be made up of Saturn as the first stage and a second stage built with a Titan power plant. We also recommended using the tooling available at Martin for the airframe. We felt that by the time we got through the second-stage tests, the powerful new Centaur oxygen-hydrogen engine would be in good enough shape to become the third stage. 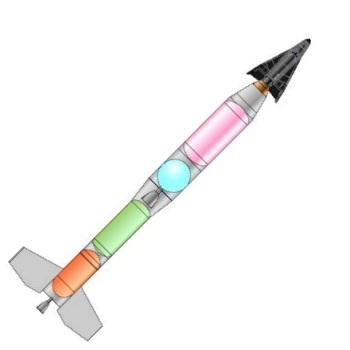 We then calculated that a, year afterwards, or perhaps a little later, could begin to come up with a second-generation satellite vehicle that would cluster the Centaur engine for second stage. Our people made extensive presentations to ARPA and NASA during the late spring of 1959, always taking the position that we could work with either combination that was agreed to by both. We were anxious to have them agree, because it seemed obvious to us that the nation could not afford more than one very large booster project. We believed that the resulting vehicle would be enormously useful both to the Defense Department for advanced defense requirements, and NASA for its scientific and civilian exploration of space. We finally got a decision. We were told that we could begin designing the complete vehicle along the lines that we had recommended, namely, with the Titan as the basis for the second stage. So far there was no sign of trouble. Remembering the difficulties that we had had in connection with our requirements for North American engines for Jupiter, with the North American people largely under control of the Air Force, we knew that if we were to get on with the job properly we had to make our contract direct with Martin for the second stage work, and with the Convair/Pratt & Whitney group for the adaptation of Centaur to the third stage. We asked the Air Force for clearance to negotiate these matters with the companies concerned The Air Force (BMD) refused, and insisted that we let them handle all areas with the contractor. They used the old argument that they as a group could handle the responsibility much better, and that if they didn't handle it, there were bound to be priority problems connected with the military programs for Titan and others. We knew that the Air Force had no technical capacity of their own to put into this project, and that if we gave them the whole job, they would be forced to use the Ramo-Wooldridge organization, now known as the Space Technology Laboratories, as their contract agent to exercise technical supervision and co-ordination. While we knew and respected a few good men in STL, we felt we had ample cause to lack confidence in the organization as such. As a matter of fact, when the House Committee on Government Operations looked askance at STL with respect to their position as a profit-making organization, some of the best men had left the organization. We threw this one out on the table and said that we would not, under any circumstances, tolerate the interference of STL in this project. We knew that we had all the technical capability that was needed to supervise the overall system, and could not stand the delays and arguments that would most assuredly result were that organization to be thrown in also. Both sides presented their arguments to ARPA...Mr. Roy Johnson ruled that we could go ahead and contract directly Martin and others as required. It is understandable that the Air Force took this decision with poor grace. It represented a major setback to the system of absolute control over their own contractors, no matter for whom those contractors happened to be doing work. It also left them pretty much on the side- lines with respect to major participation in or control over any portion of the Saturn as a space vehicle. With the amount of money still available to us from fiscal year 1960 and with our authorization from ARPA, we proceeded immediately to negotiate engineering contracts with Martin. We thought that since Mr. Johnson had complete control over this program, we had gotten over the last important hurdle and could get on about our business. Little did we realize the hornet's nest that had been stirred up, and less did we realize that winning that battle was finally to mean that we would lose the war, and would lose von Braun's entire organization. We had only a few weeks of peace and quiet. From events that occurred later, I think I can make a fair estimate of what happened during this short period. Having been overruled by Johnson, the Air Force took a new approach. They decided that in view of the importance and power that was given the Deputy Secretary of Defense for Research and Engineering by the 1958 changes in the defense organization, Dr. York represented their best avenue of approach through which to get back in the war. For reasons of economy we had recommended, and it had been approved, that in building the second stage, we would use the same diameter as the Titan first stage -- 120 inches. The major costs of tooling for the fabrication of missile tanks and main structure is related to the diameter. Changes in length cost little or nothing in tooling. How the tanks are divided internally, or the structure reinforced inside, or the kind of structural detail that is used at the end in order to attach the structure to a big booster below, or to a different size stage above, have very little effect on tooling problems. However, a change in diameter sets up a major question of tools, costs, and time. Suddenly, out of the blue came a directive to suspend work on the second stage, and a request for a whole new series of cost and time estimates, including consideration of increasing the second stage diameter to 160 inches. It appeared that Dr. York had entered the scene, and had pointed up the future requirements of Dynasoar as being incompatible with the 120-inch diameter. He had posed the question of whether it was possible for the Saturn to be so designed as to permit it to be the booster for that Air Force project. We were shocked and stunned. This was no new problem, and we could find no reason why it should not have been considered, if necessary, during the time that the Department of Defense and NASA were debating the whole question of what kind of upper stages we should use. Nevertheless, we very speedily went about the job of estimating the project on the basis of accepting the 160-inch diameter. At the same time it was requested that we submit quotations for a complete operational program to boost the Dynasoar for a given number of flights. As usual, we were given two or three numbers, rather than one fixed quantity, and asked to estimate on each of them. By this time, my nose was beginning to sniff a strange odor of "fish." I put my bird dogs to work to try to find out what was going on and with whom we had to compete. We discovered that the Air Force had proposed a wholly different and entirely new vehicle as the booster for Dynasoar, using a cluster of Titan engines and upgrading their performance to get the necessary first-stage thrust for take-off. This creature was variously christened the Super Titan, or the Titan C. No work had been done on this vehicle other than a hasty engineering outline. Yet the claim was made that the vehicle in a two-stage or three-stage configuration could be flown more quickly than the Saturn, on which we had already been working hard for many months. Dates and estimates were attached to that proposal which at best ignored many factors of costs, and at worst were strictly propaganda. It can be seen in this quotation that the Army and von Braun team were completely in the dark on the development work done by Martin and Aerojet on the Titan C by that time. So the Saturn I launch vehicle became the leading candidate to boost Dynasoar, at least in the eyes of the Pentagon's civilian bureaucracy. There were elements in the Air Force pushing yet a third vehicle - their (also very secret) visionary Space Launching System family of modular launch vehicles. Complicating matters further was an Air Force 'SLV-4' requirement, beyond Dyna-Soar, for development of a large booster. This new vehicle would be needed by the late 1960's for launch of ten-metric ton reconnaissance satellites into low orbit and heavy communications, ELINT, and early warning satellites into high orbits. So production of Titan I boosters for Dynasoar Phase 1 was authorized while a decision on the orbital booster was deferred. The Titan C suffered blow after blow. On 31 May 1960, Aerojet lost the competition to Rocketdyne for development of the J-2 engine for Saturn upper stages - despite the fact that Aerojet had already completed tests of their LR87. By January 1961 it was decided to use the Titan 2 instead of the Titan 1 for the suborbital flights. In July 1961 the Air Force dropped the Titan C and Saturn I alternatives and recommended production of the Space Launching System for the SLV-4 requirement. The A-388 'Phoenix' variant of the modular booster would provide Dyna-Soar's ride to orbit. Meanwhile the first test firings of large segmented solid propellant boosters had occurred. This was a key technology for the Space Launching System. But it could equally be applied to the proven Martin Titan vehicle family. So the selection of the Space Launching System was overturned three months later and the Titan 3 became the heavy-launch vehicle for the USAF. This consisted of the Titan 2 as a core vehicle, with two large segmented solid propellant boosters. This was the end of the road for the Titan C. A month later, at the end of 1961, it was decided to dump the Titan 2 sub-orbital phase of Dyna-Soar launches, and use the Titan 3 alone for Dyna-Soar launches. LEO Payload: 7,300 kg (16,000 lb) to a 480 km orbit at 28.00 degrees. Stage 1. 1 x Titan 2-1. Gross Mass: 117,866 kg (259,850 lb). Empty Mass: 6,736 kg (14,850 lb). Thrust (vac): 2,172.231 kN (488,337 lbf). Isp: 296 sec. Burn time: 139 sec. Isp(sl): 258 sec. Diameter: 3.05 m (10.00 ft). Span: 3.05 m (10.00 ft). Length: 22.28 m (73.09 ft). Propellants: N2O4/Aerozine-50. No Engines: 2. Engine: LR-87-7. Status: In Production. Stage 2. 1 x Titan C-2. Gross Mass: 57,400 kg (126,500 lb). Empty Mass: 6,000 kg (13,200 lb). Thrust (vac): 666.000 kN (149,722 lbf). Isp: 403 sec. Burn time: 300 sec. Isp(sl): 350 sec. Diameter: 4.07 m (13.35 ft). Span: 4.07 m (13.35 ft). Length: 19.50 m (63.90 ft). Propellants: Lox/LH2. No Engines: 1. Engine: LR-87 LH2. Status: In Development 1961. Comments: Engine developed 1958-1960, but launch vehicle cancelled 1961. Family: orbital launch vehicle. Country: USA. Spacecraft: Dynasoar. Stages: Titan C-2, Titan 2-1. Agency: Martin. 1958 April 25 - . LV Family: Thor, Titan. Launch Vehicle: Thor Able, Titan C.
USAF goal to to "...land a man on the moon and return him safely to earth". - . Spacecraft: Man-In-Space-Soonest, Lunex. 1958 June 16 - . LV Family: Titan. Launch Vehicle: Titan C.
Dynasoar Phase I contracts announced. - . Nation: USA. Class: Manned. Type: Manned spaceplane. Spacecraft: Dynasoar. Phase I contracts for the Dyna-Soar boost-glide orbital spacecraft are awarded by the USAF to two teams of contractors: one headed by Boeing (Aerojet, General Electric, Ramo-Wooldridge, North American, and Chance Vought), and one headed by Martin (Bell, American Machine & Foundry, Bendix, Goodyear, and Minneapolis-Honeywell). Under the $ 9 million one-year contracts each team was to refine its design, leading to a competitive down-select. 1959 June 1 - . LV Family: Titan. Launch Vehicle: Titan C.
Dyna-Soar contractors Boeing and Martin selected. - . Nation: USA. Spacecraft: Dynasoar. The Dyna-Soar source selection board completed its evaluation of the proposals of the Boeing Airplane Company and the Martin Company. The board recommended the development of the Boeing glider but also favored the employment of the orbtal Titan C booster offered by Martin.